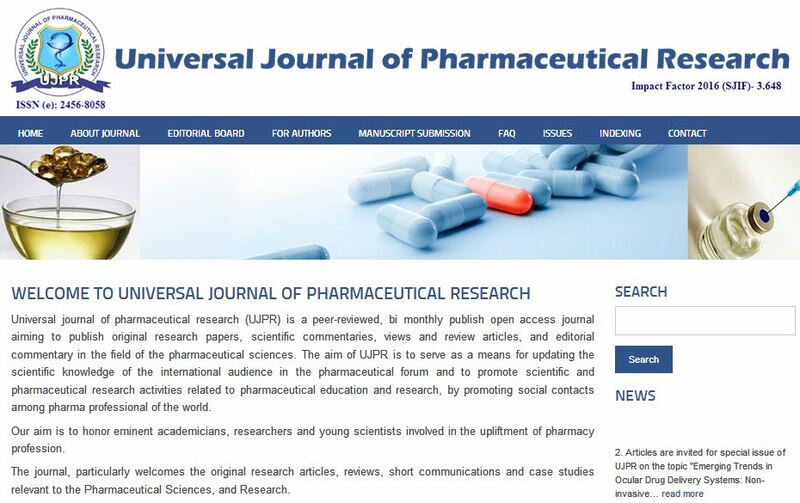 Universal journal of pharmaceutical research (UJPR) is a peer-reviewed, bi monthly publish open access journal aiming to publish original research papers, scientific commentaries, views and review articles, and editorial commentary in the field of the pharmaceutical sciences. The aim of UJPR is to serve as a means for updating the scientific knowledge of the international audience in the pharmaceutical forum and to promote scientific and pharmaceutical research activities related to pharmaceutical education and research, by promoting social contacts among pharma professional of the world. Our aim is to honor eminent academicians, researchers and young scientists involved in the upliftment of pharmacy profession. Pharmaceutics, Pharmacology, Pharmaceutical Chemistry, Pharmacognosy and Phytochemistry, Biopharmaceutics, Pharmaceutical Analysis, Pharmaceutical Microbiology, Pharmaceutical Biotechnology, Pharmacology and Toxicology, Clinical Pharmacy, Bioinformatics, Pharmaceutical Management, Health Care Management, Hospital Management, Biochemistry, Regulatory Affairs, Pharmacovigilance, Clinical Research, Hospital Pharmacy, Community Pharmacy, Quality Assurance, Computational Chemistry, Molecular Drug Design, Pharmacy Practice, Pharmaceutical Marketing Research, Regulatory Affairs, "Nanotechnology Novel Analytical Methods for Drug Characterization, Physical Pharmacy and Other Pharmacy Related Fields".